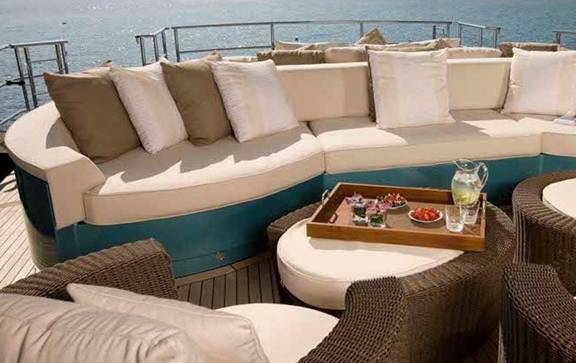 Outdoor furniture is just as important part of your yacht décor as the furnishing inside the vessel. Mega Yacht Cleaning is a full-service outdoor furniture cleaning company. We give your outdoor patio furniture as much care as the most luxurious interior furniture. Mega Yacht Cleaning is a full service provider for total yacht cleaning, inside and out. This includes all of your patio furniture and exterior furniture cleaning. Outdoor furniture cleaning can be tough since you have to battle the effects of the elements, but our professionals have over 15 years of experience handling the worst that Florida`s weather can inflict on your furniture. We work on your schedule; we come onto your yacht for exterior furniture cleaning when you are available. We also offer free pickup and delivery if you want us to take outdoor cushions, pillows, or anything else back with us for cleaning. You get a free estimate before we do any work so you are comfortable with the services you are receiving. Ask us for references; we have plenty of happy customers who would love to share their experience with you. Call Mega Yacht Cleaning at (954) 448-8899 to get in touch with us about our superior deck furniture cleaning for yachts.